Kadalai kuzhambu is a traditional preparation that will come in handy if you do not have enough vegetables for making sambar or kuzhambu. 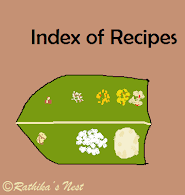 It also ensures that you incorporate legumes (பயறு வகைகள்) in the menu, thereby increasing the overall nutrition of the food prepared at home. *Dried peas (வெள்ளை பட்டாணி), whole Bengal gram/ kala channa (கொண்டைக் கடலை), green gram (பச்சைப் பயறு), black eyed peas/lobia (காராமணி) or Indian bean/ ballar (மொச்சைப் பயறு) may be used. Soak the legume in water overnight. Method: Soak dried peas in water overnight or for 8 hours. Pressure cook the peas for 6 minutes or 6 whistles and keep aside. Heat a teaspoon of oil in a kadai. Fry urad dhal till the dhal turns golden brown in color. Add asafoetida and switch off the fire. Allow it to cool. Grind the fried ingredients with coconut and little water into a fine paste. Soak tamarind in warm water for 15-20 minutes. Later squeeze tamarind and extract the juice. Add sambar powder, salt, jaggery and tomato pieces to the tamarind juice. Bring it to boil in a kadai. Add cooked peas and allow it to boil for 2-3 minutes. Reduce the fire. Dilute the ground paste in little water. Add this mixture slowly to the boiling kuzhambu, stirring continuously to avoid lumps. Simmer for 1-2 minutes and switch off the fire. Heat the remaining oil in tadka pan/spice pan (தாளிக்கிற கரண்டி), add mustard seeds, and when they start to sputter switch off the fire. Add seasoning to kuzhambu and garnish with curry leaves. Serve hot with rice and poriyal or appalam.